In the outer reaches of the galaxy, life can take weird forms indeed. 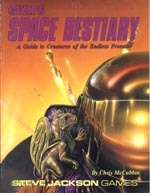 The GURPS Space Bestiary presents over 300 extraterrestrial creatures for the science fiction roleplaying campaign. In addition to strange and dangerous variations on earthly animals, this book contains examples of silicon life, crystalline creatures, energy and liquid beings, vacuum dwellers and many more bizarre lifeforms. Inside you'll find fierce predators, treacherous trappers, gigantic herd beasts, carnivorous plants, scientific curiosities and valuable rarities. All are completely defined and cross-referenced to make it easy for the Game Master to pick just the right creatures to populate his campaign world . . . and there are over 100 detailed illustrations. The creatures are organized according to habitat, including every earth-type environment, plus interstellar space and other exotic, hostile places wher man could never survive. There is even a special section on the pets and domestic animals of a spacefaring society! 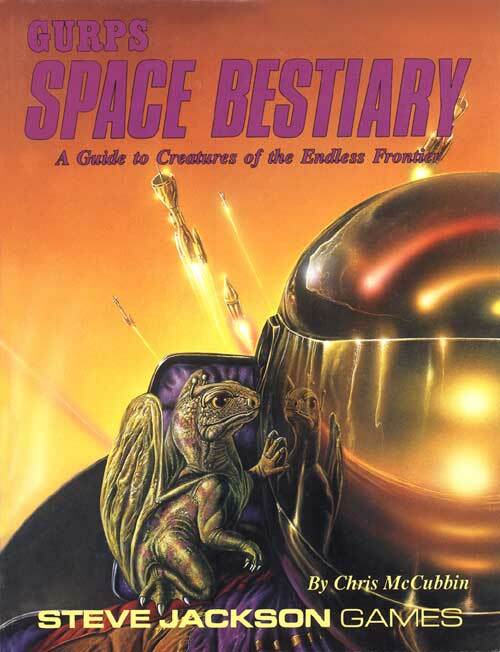 The Space Bestiary isn't just for GMs running a GURPS Space campaign. A fantasy, horror or post-holocaust game needs strange monsters too. And some of the nastier beasts can even challenge a team of supers! Also included is advice for the GM who wants to create his own creatures – features to emphasize, creative ways to let the beasts interact with the PCs, and hints for devising ecologically sound and believable animals – and a bibliography of science-fiction source material.